The original AX10™ Scorpion hit the market in April of 2007. It was Axial’s first vehicle which brought crawling to the mainstream and quickly became the most influential crawler in the industry. Since then, Axial has made numerous advancements through a variety of chassis designs which developed new categories within the crawling segment. April 2012 marks the five year anniversary of the AX10™ and Axial felt that it was time for the product that launched us into the crawling segment to undergo some evolution and receive some trickle-down technological advancements of its own! We have not changed the original scope of the vehicle; the AX10™ Ridgecrest™ is still the “Leatherman” of the Axial product line and it’s where backyard crawling begins. We have taken key items from our products and put them into the AX10™ Ridgecrest™, along with an all-new tube style chassis. The most noticeable performance upgrade of the AX10™ are the Ripsaw™ tires, with their 5.5″ tall by 2.1″ wide stance, mounted on officially licensed Raceline Renegade wheels. But what you do not see is the updated suspension geometry that also delivers better articulation. All delivered through Dana 60 inspired AR60 OCP-Axles™ that have already been proven on the Axial Wraith™. The AX10™ Ridgecrest™ is a highly capable, affordable starting point for anyone. 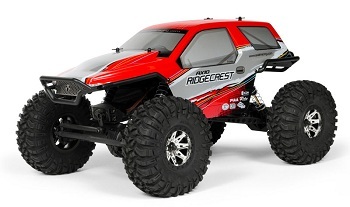 If you are not sure what you want to do and how you want to do it within the various segments of crawling, the AX10™ Ridgecrest™ is the most versatile truck with scale looks, performance driven components and the right amount of speed mixed with technical crawling prowess – all in one rig. • All-new tube style chassis design. • 87/20 gearing (87T spur gear, 20T pinion gear). • Competition legal 12″ wheelbase. • Adjustable tray that accepts standard stick packs or lipo batteries. • Adjustable suspension and shock mounting positions. • WB8 Wild Boar™ splined driveshafts. • Ripsaw™ tires mounted on Raceline Renegade wheels. • Double shear link mounts.